30 September 1975: At Palomar Airport (CRQ), Carlsbad, California, Hughes Helicopter Company Chief Test Pilot Robert George (“Bob”) Ferry (LTC, USAF, Ret.) 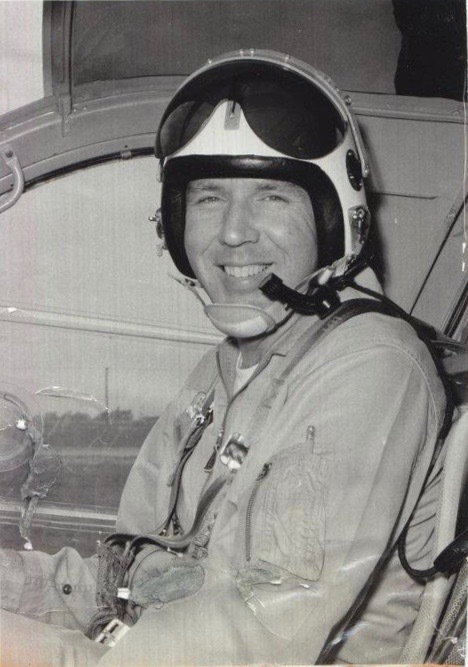 and Raleigh Ellsworth (“Bud”) Fletcher made the first flight of the YAH-64 Advanced Attack Helicopter prototype, U.S. Army serial number 74-22248. This aircraft was the second of three prototypes built by Hughes and was identified by the company as AV-02. AV-01 was a ground test prototype, while AV-02 and AV-03 (74-22249) were used for flight testing. The first flight took place one day before the first flight of the rival Bell YAH-63. 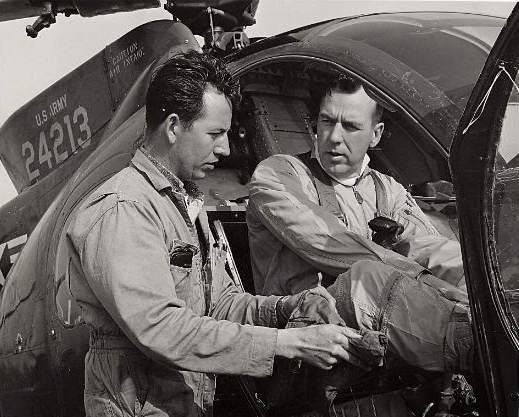 Robert G. Ferry, Chieft Test Pilot, Hughes Helicopters. 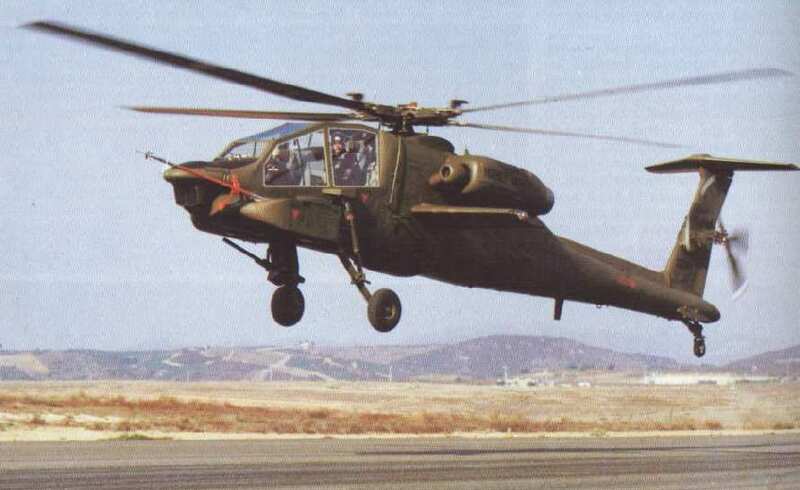 The YAH-64 was designed as a two-place, twin-engine ground attack helicopter. The pilots sit in tandem configuration like the earlier Bell AH-1G Huey Cobra. The prototype was 57.50 feet (17.526 meters) long, with rotors turning, and the fuselage had a length of 49.42 feet (15.063 meters). The overall height of 12.07 feet (3.679 meters). 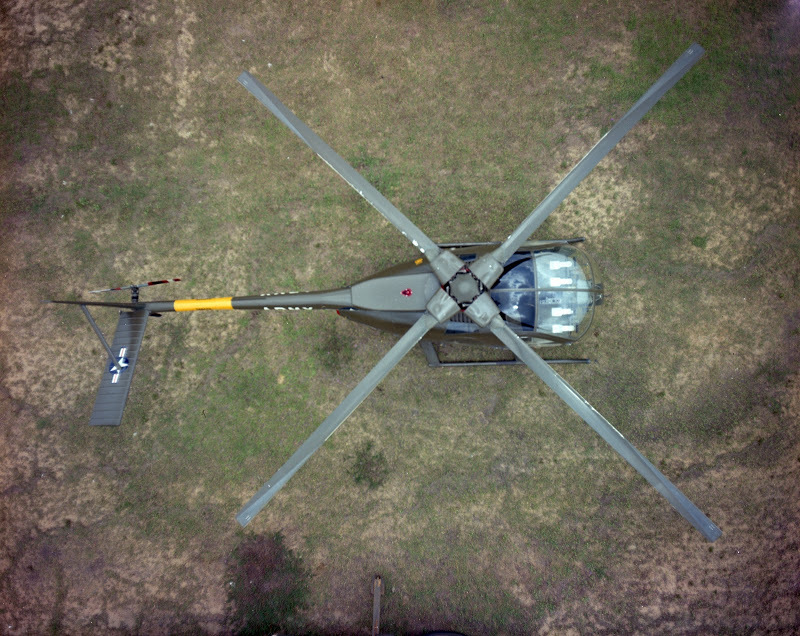 The four-blade fully-articulated main rotor turns counter-clockwise, as seen from above (the advancing blade is on the right), and has a diameter of 48.00 feet (14.630 meters). It turns at 289 r.p.m., giving the blades’ a tip speed of 726.36 feet per second (211.70 meters per second). The main rotor uses elastomeric lead/lag dampers and the blades are retained by laminated V-shaped stainless steel “strap packs” which are flexible to allow blade flapping and feathering. The main rotor is mounted to a hollow static mast with a concentric drive shaft inside. The four-bladed tail rotor is unusual in that, rather than the blades being evenly spaced at 90° intervals, the blades are spaced at 55° and 125° angles. This allows for significant reductions in noise. 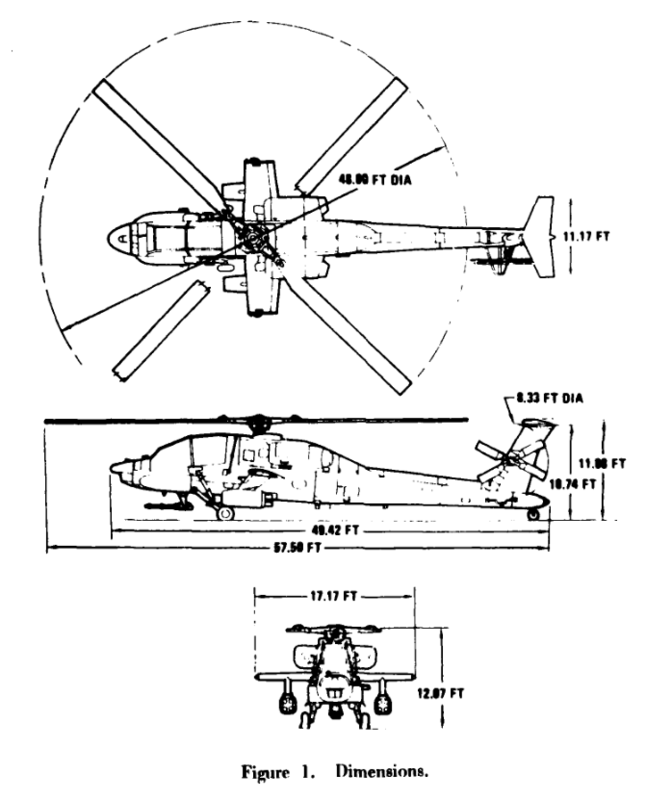 The tail rotor is mounted on the right side of a pylon above the tail boom in a pusher configuration, and rotates clockwise as seen from the helicopter’s left (the advancing blade is below the axis of rotation). It has a diameter of 8.33 feet (2.539 meters) and turns 1,411 r.p.m. (tip speed, 727.09 feet per second/221.62 meters per second). A stub wing provides additional lift in forward flight and can carry various combinations of guided missiles and rockets. It has a span of 16.33 feet (14.977 meters). 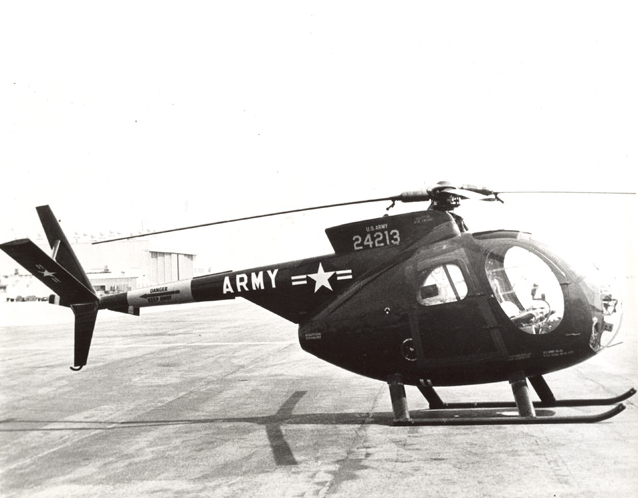 In the original configuration, the YAH-64 had a “T-tail” with the horizontal stabilizer attached to the top of the tail rotor pylon. This caused undesirable changes in pitch attitude during flight testing and was changed with the follow-on YAH-64A pre-production prototypes. The YAH-64 was powered by two prototype General Electric YT700-GE-700 turboshaft engines. These were rated at 1,536 shaft horsepower at 20,000 r.p.m., at Sea Level on a Standard Day. The helicopter carried fuel in two internal tanks with a total capacity of 353 gallons (1,336.25 liters). This gave the two prototypes a mission endurance of 2 hours, 42 minutes. The two flight test aircraft, 74-22248 and its sister ship 74-22249, were the subject of extensive flight testing during the summer of 1976. 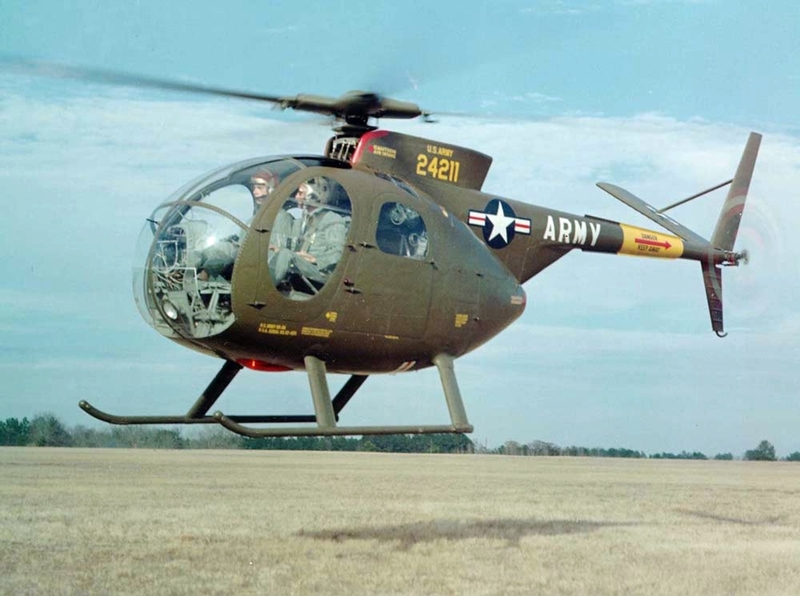 At that time, the YAH-64 had an empty weight of 10,495 pounds (4,760 kilograms), loaded weight of 12,242 pounds (5,553 kilograms) and a maximum gross weight 17,900 pounds (8,119 kilograms). The two YAH-64s were tested at Edwards Air Force Base and the nearby Naval Ordnance Test Station Chine Lake. Additional testing was conducted at Bishop, California (elevation 4,120 feet/1,256 meters) and Coyote Flats (9,500 feet/2,896 meters). The helicopter could hover out of ground effect (HOGE) at its maximum gross weight at and altitude of 5,350 feet (1,631 meters) with an ambient temperature of 95 °F. (35 °C.) From an out of ground effect hover at 4,000 feet, it could climb vertically at 184 feet per second (56.1 meters per second). At maximum continuous power its cruise speed in level flight was 141 knots, slightly less than required by the Army. With one engine inoperative, the helicopter’s ceiling was 4,750 feet (1,448 meters). There was a 100 foot difference in altitude with the left and right engines. The 30 mm Hughes XM 230 Chain Gun automatic cannon was installed on the YAH-64 with 90 rounds. The gun’s rate of fire was adjustable and it was set to 535 rounds per minute on the prototype. 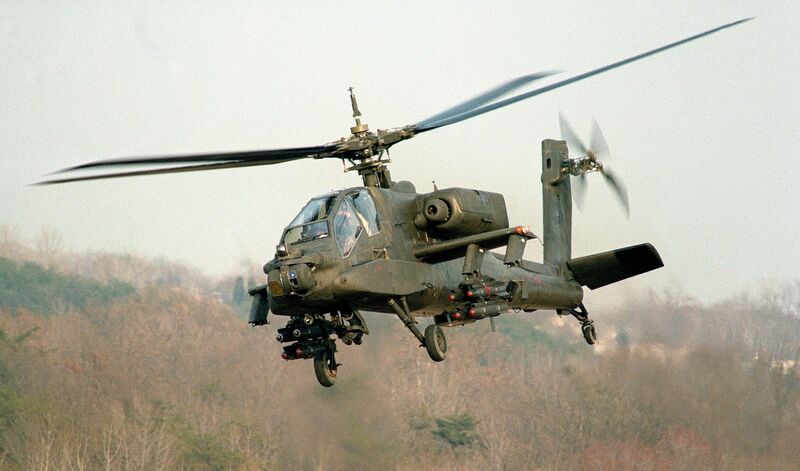 The AH-64A Apache was approved for full production in 1982. In 1984, the Hughes Helicopter Company was purchased by McDonnell Douglas and renamed McDonnell Douglas Helicopter Company. 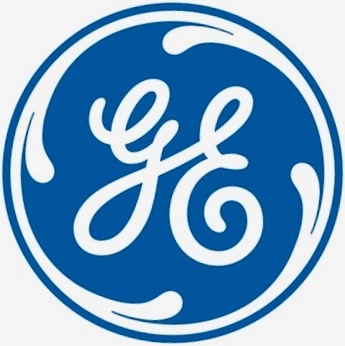 A facility to produce the Apache attack helicopters, as well as other civil and military helicopters, was opened in Mesa, Arizona. In 1997, MDHC was acquired by Boeing. 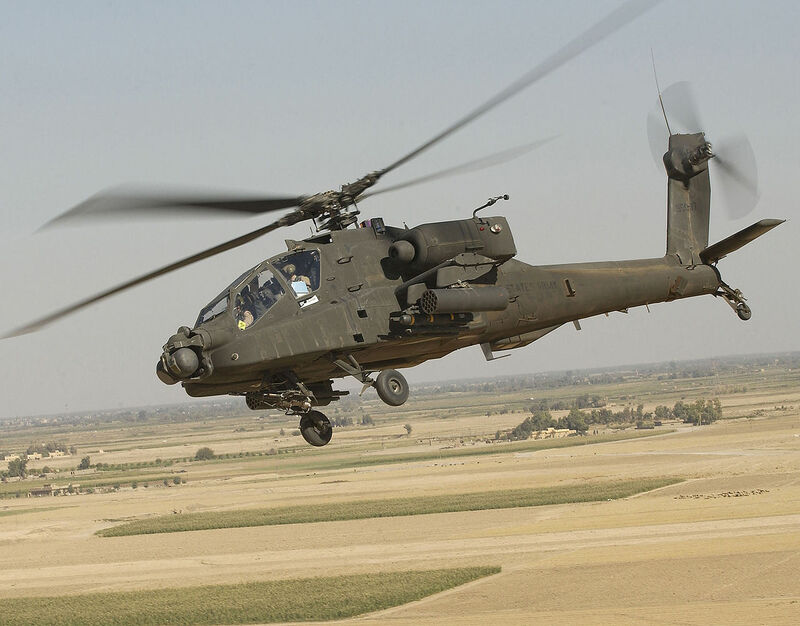 937 AH-64A attack helicopters were built between 1984 and 1997, when the improved AH-64D Apache Longbow entered production. Many AH-64As were remanufactured to the AH-64D configuration. More that 2,000 Apaches have been built. While most were for the U.S. Army, they fly for at least 14 other countries. The Hughes YAH-64, 74-22248, is in the collection of the U.S. Army Aviation Museum, Ozark, Alabama.